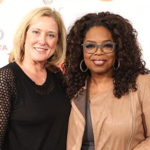 HOUSTON, TEXAS— Three years ago while attending one of Oprah’s Life You Want Weekends, Connie Rankin met Oprah Winfrey. Summoning her courage, Rankin shared with Oprah her dream of writing a book that would empower women to move out of fear into faith. Rankin then asked Oprah for permission to include Oprah’s own compelling story in the book she envisioned. Oprah agreed, and her contribution is included in Rankin’s new book, God Gave Us Wings: A Journey to Success: Theirs, Mine, and Yours, along with the stories of nine other powerful women who have survived incredible challenges, learned to thrive and completed the circle by giving back to others. When the Morgan James title came out in April, it immediately became an Amazon #1 Best-seller in new releases. More recently on Aug. 5, the book captured gold and silver medals in the 2017 Florida Authors and Publishers Association President’s Book Award competition. The awards honor contemporary authors who put their heart and soul into their work as Rankin has done. Still, Rankin believes Oprah’s blessing was a contributing factor. Rankin is particularly grateful for the effect her book is having in the General Educational Development (GED) non-profit market, and being circulated to outreach centers such as the Baker Ripley House https://goo.gl/wvTzBv, where it is being used as part of its curriculum to inspire people to further their education. In addition to being sold in bookstores across the country, God Gave Us Wings is being made available to women’s ministries and is even scheduled to go to an orphanage for teenage girls in India.